Collins Booksellers - American Cop by Loren Culp, 9781733710411. Buy this book online. Chief Loren Culp stood up for the rights of citizens in the face of a statewide initiative to restrict gun rights that he believed went against his oath of office. Was it the right thing to do? Whether you are liberal or conservative, pro-gun or anti-gun, you will find the information provided in this book compelling. Many have said that police just need to enforce the law because they are law enforcement. Chief Culp says ‘that’s not true’. Who is right? 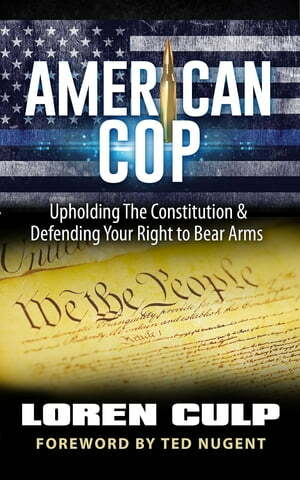 Get an inside look at why Culp chose to uphold the constitution and defend your right to bear arms. Loren Culp has been the Police Chief of Republic, Washington for over 2 years. He has been a patrol officer, narcotics detective, police sergeant and is currently a K9 handler. He is a former sergeant in the U.S. Army and is an avid hunter and supporter of the Constitution. He has been a guest on many national television and radio shows and was featured on FOX News with Tucker Carlson. He has been married to his wife Barb for over 40 years and has seven grandchildren. Go to www.chiefculp.com to download Chief Culp's Top 10 Gun Rights Fact Sheet today.